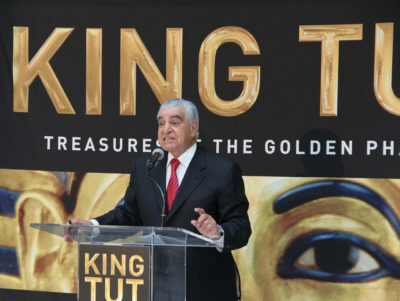 Dr. Zahi Hawass, famed Egyptian archaeologist spoke at the Los Angeles opening of the new King Tut exhibit. “King Tut: Treasures of the Golden Pharaoh” tickets are now available. Although the exhibit at the California Science Center in Exposition Park runs through the end of the year, it is expected to sell out. Three previous visits of Tutankhamun artifacts to Los Angeles, to the Los Angeles County Art Museum in 1962, 1978 and 2005, resulted in long lines as more than 2.3 million visitors viewed the belongings of the ancient boy king. Tutankhamun was an Egyptian pharaoh of the 18th dynasty who ruled between 1332 and 1323 B.C. and is best known as “King Tut.” In 1922, British archaeologist Howard Carter discovered the young king’s tomb, sparking a renewed interest in Egyptian history and artifacts. Another way to look at the previous local attendance of 2.3 million is that that represents nearly 60 percent of the present four million population of the City of Los Angeles. Nearly two thirds of the population bought tickets to view at least some of these ancient Egyptian artifacts over the cumulative 21 months that the materials previously have been in our city! There is no reason to think that Los Angeles demand will be any less this time, a trip that the sponsors from the Egyptian Ministry of Antiquities say will be the last visit for King Tut materials going on display outside of Egypt. 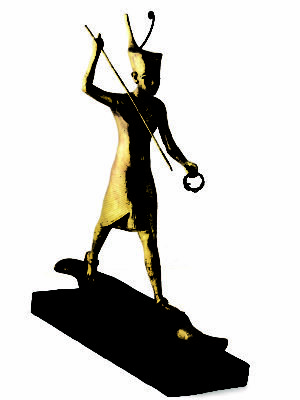 GILDED WOODEN FIGURE of Tutankhamun on a skiff, throwing a harpoon, on view locally. This is a new exhibition that celebrates the 100-year anniversary of the discovery of King Tut’s tomb. The exhibition will travel throughout Europe following its inauguration here in Los Angeles. Its collection represents the largest assembly of artifacts and gold from Tutankhamun’s tomb ever on public display outside of Egypt, and it includes more than 150 real artifacts, triple what has ever toured before. Forty percent of the items on display are traveling outside of Egypt for the first — and last — time. “Last” because the plan is that these materials, following the tour, will return to Egypt, once and for all, to be placed on permanent display at the new Grand Egyptian Museum under construction in Giza. Unlike past tours of Tut artifacts, “King Tut: Treasures of the Golden Pharaoh” is exclusively focused on interpreting the significance and meaning of what was found in Tutankhamun’s 3,300-year-old tomb. Among the many important works on display is a gilded wooden figure of Tutankhamun on a skiff, throwing a harpoon. There are many, many more. A significant feature of what visitors will find at the Science Center are exhibit cases containing many exquisite small items created for the Boy King to use in life or in death, including rings found on his fingers, the opulent jewelry on his body and the gold sandals that were placed on the 19-year-old’s feet prior to burial. Explaining these and other pieces are multimedia displays that also describe the process through which archeologists have found and preserved the artifacts. 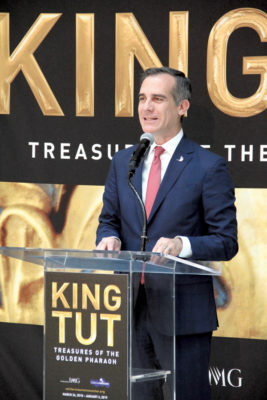 Mayor Eric Garcetti presided at a press preview three days before the exhibit opened on March 24. There, California Science Center president Jeff Rudolph said the exhibit includes “nine distinct experiential galleries on two floors of the museum, 3-D visuals, digital content, 360-degree theatrical manifestations, custom soundscapes and more.” And it really does. Get tickets!